Mobile phone applications have become part of our lives, you can find answers to existential questions using Google as you walk down the street, check to see if a picture is hanging straight using Spirit level plus, take a photo of someone falling off their bike and send it via Twitter or Facebook for the entire planet to enjoy and laugh at another's misfortune. You can get your children off your back by downloading a mindless game for free, or even help them do their homework with an educational app. You can browse the internet, gaze at the stars, find a restaurant, a hotel, store your personal files, watch a film, find a recipe, find a person or even find your mobile phone if you lose it using built in mobile gps technology. Yes, there is indeed an application for nearly everything, as the advertisement says. Now comes the problem with this plethora of useful technology. Finding the one for you. You can of course find an application, look at similar applications and applications seen by those who liked the one you are looking at, and eventually you may find the one you are after, and so if you REALLY need an application to get on with your life, or you are bored sitting in a doctors waiting room you will go through the aforementioned process. So what do you download when travelling? Tripadvisor is a good one without a doubt, Google maps is very handy, a weather app of course and there are many other mainstream applications which will help, but recently the development of very specific theme based apps have started to reveal themselves to those who know where to look. So to save you the hassle of spending hours searching here are a few of the essential travel applications when coming to Provence. 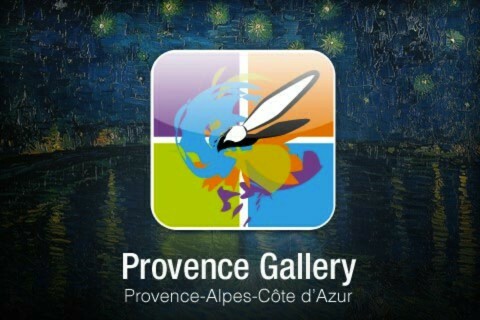 This free application was created by Zevisit for the Provence-Alpes-Côte d'Azur Regional Tourist Board. Wherever you find yourself in Provence, this application will find the nearest landscape that provided inspiration for one of it's great artists. 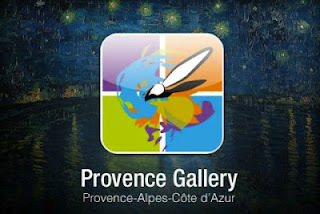 You may well be familiar with the works of Cezanne, Van Gogh, Dufy, Gaugin and many more besides, and using this application you can see and even take a picture and upload it to an on-line gallery to share with other Provence Gallery users. Obviously when you are in Arles or near the Montagne St Victoire in Aix your phone will be telling you non stop that you are near the site of a painting (the Painting alert function can be dis-activated ). You can search by artist, by painting or by place and when you have chosen your masterpiece, you have a short but very informative audio text telling you about the history behind the painting. It's a simple app and is a great way to discover the artistic side of Provence as you travel, a recommended download before you leave. 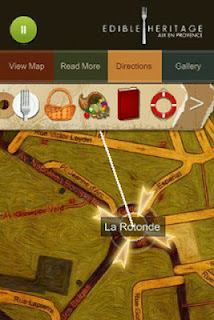 This application is like having your own personal guide of the city of Aix en Provence. Open up the application and you will start with an introduction to the town of Aix en Provence. The Edible Heritage tour takes you through the city with very detailed audio descriptions including historical, architectural and also indicating surrounding restaurants, shops as well as what you can buy in them, from traditional Boutis to Callisons. You don't have to follow the tour, if you prefer you can wander the streets and click on any place of interest and listen to the audio guide. If it is around lunch time you can click on the knife and fork and see which restaurants can be found nearby, with a description of each when clicked on. The application was created by two Canadians who wanted to share their love of Aix en Provence and also their in depth knowledge in the history and traditions to be found there. Although the database is quite extensive, the application does not contain every restaurant in Aix since the creators have only included ones that are tried tested and approved by them, but I would imagine that updates will be forthcoming, and maybe via the contact page on their site http://edibleheritage.com/ you can give your own comments on any discoveries you make on your voyage. I recommend downloading it a while before you leave and you can start your voyage of discovery and begin to whet your appetite back home. For 2.30€ you will not find a guide as informative and always at the ready anywhere else, you can of course opt for a real flesh and blood guide, but move the decimal along a couple of notches...and some, and that's for one day only! 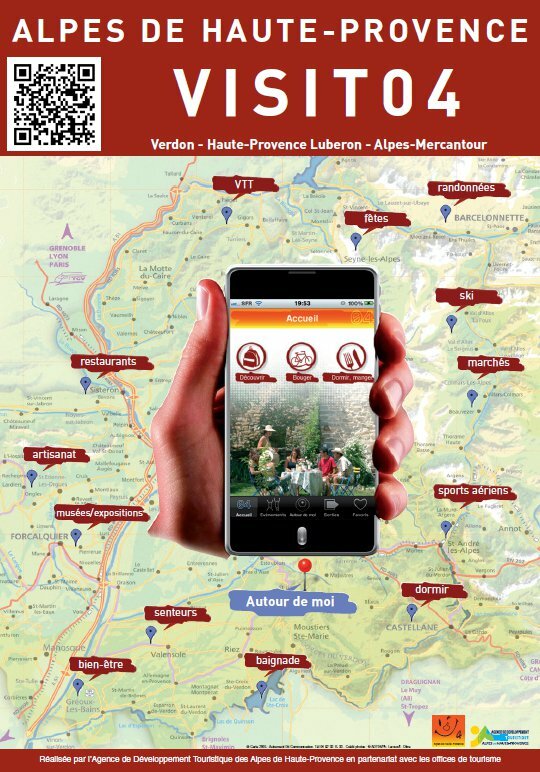 Created by Francophile Paul Shawcross here is an app that will guide you through Provence and beyond as far as Aigues Mortes and as far North as the Ardeche neither of which is strictly speaking in Provence. But I can see why they are there, I wouldn't be able to contain myself to strict geographical limits if I was creating such an app and I would imagine that if you are visiting the region you wouldn't either! However the Eastern limits are Aix en Provence and Cassis, and he recommends other apps (Riviera Roaming App by Kimberly Lovato) and a forthcoming app called Nice and Easy Nice to cover the missing department of Les Alpes Maritimes. I would have liked to have seen the Provence Verte included, (around Brignoles) as here there are a myriad of secrets to reveal and it is often left out. I hope that this will figure in later editions. The informative text for each entry is written with authority and I would even say affection as he is not just mindlessly listing places but is sharing his vision as well as that of other people mentioned in the app and I suspect using their personal recommendations for some of the addresses, but this is hardly surprising as Paul Shawcross is a travel writer who is no stranger to Provence and that is why this is a must have guide. It may not have every place listed, but it has the most important sites as well as some lesser known ones like the Tom Simpson Memorial on the top of the Mont Ventoux. It has a list of restaurants recommended by the author, some hotels, camp sites and even an address for camper-van hire. There is plenty of historical background about Provence and even a section on the Troubadours. Another aspect of this app that I like is the fact that you can leave comments and Paul will get back to you with a pertinent answer, an unlikely event with major tourist guides. It is an app that I will recommend to my self-drive clients (along with a few others mentioned in this post) for its good accurate information from someone who is talking from personal experience. Like Edible Heritage it is worth downloading this before you leave so as to whet your appetite for your journey to come! The App is available for I-Phone & I-Pad as well as Android platforms for a mere $2.99. This is an application for the bikers, that is motor bikers. 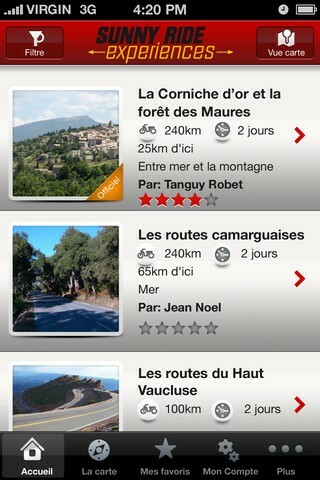 Only available on iPhone at the moment and in French but definately worth the detour. This is another application created for the Provence-Alpes-Côte d'Azur Regional Tourist Board this time by Azur Consulting. It comprises pre-established itineraries for biking around the region, giving you information on restaurants, petrol stations, museums and other useful points of interest on the way. You have information on the distance, and difficulty as well as the time required to complete the itinerary. You can also create your own itinerary and upload it. This is a free application which I'm sure could also be used by motorists, but be careful of the bikers please! 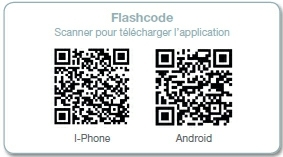 A free application only available in French for the time being. The QR code on the picture (click for a bigger version) will take you to the app on iPhone and to a mobile site for Android. Showcasing a favourite destination of mine the department of Les Alpes de Haute Provence, which stretches from the Montagne de Lure, via Forcalquier (where I am sitting writing this article) over the Durance valley to the Valensole plateau and its endlesss lavender, the Verdon river and the Gorges of the same name an all of that neatly packaged by the Alps to the north and east. Sounds good doesn't it! If you want to know more contact us here. http://www.unique-provence.com/contact-us An article on this amazing destination is coming soon. Provence and French Riviera by MobileReference Travel, which comes in free and paying versions and is a much lighter way of keeping a guide book of the entire region at your fingertips. Find top attractions, restaurants etc along with phrasebooks and gps maps showing your location. If you know of any good apps to enhance your visit to Provence, leave a comment or contact us http://www.unique-provence.com/contact-us and don't hesitate to give your opinions of the above applications. Now this looks like a good traveler's app to grab. I just hope they make an app of this quality for us bike riders back here in the States; it'll be a great add-on for those long-haul motorcycle trips.